PRC 2015 FIXATION TABLE with HRA 12%-14.5%-20%. GO.166,DT.11-12-15.ALLOWANCES –Slaughter House Allowance –Revision of Pay Scales, 2015- Orders - Issued. PRC THROUGH HRMS INFORMATION IN TELUGU. PRC process in HRMS in Telugu. We have already given more illustrations on PRC 2015 Pay Fixation and 12 Years Scale for DSC 2001 SG Teachers/LPTs. DSC 2001 Teachers raising doubts on their fixation. Because, they have already got two(2) increments due to completion of 12 years service in the previous PRC 2010 due to not reached entry level of next promotion post. But, the Same got two increments want to in New PRC 2015 at the time of fixation. But now 2001 DSC SG Teachers/LPTs have already reached entry level of next promotion post at the time pay fixed in RPS-2015. So, due to completion of 12 yrs service, the pay may be fixed in SPP-IA Scale by giving one(1) increment. Srikakulam Dist: 1.Srikakulam, 2.Palasa, Kasibugga. East Godavari Dist:5. Tuni,6.Samalkot, 7.Pithapuram,8.Mandapet,9.Amalapuram. West Godavari Dist:10.Tadepalligudem, 11.Tanuku, 12.Bhimavaram, 13.Narasapur, 14.Palakole. Krishna Dist:15.Jaggaiahpet,16. Nuzvid, 17.Gudivada, 18.Machilipatnam. Guntur Dist:19. Macherla, 20.Piduguralla,21.Tadepalle,22.Mangalagiri, 23.Sattenapalle,24.Vinukonda,25.Narasaraopet, 26.Chilakaluripet,27.Tenali,28.Ponnur,29.Bapatla,30.Repalle. Kadapa Dist. :37.Badvel, 38.Jammalamadugu, 39.Pulivendla,40.Rayachoti, 41.Rajampet. Ref:- Govt. Lr. No. 247/01/A1/HRM.V/2015-3, Fin. (HRM.V) Dept., dated 08.01.2015. The Hon'ble Minister for Finance has convened a meeting with the Employees Associations on Implementation of the 10th PRC at 2.00 P.M. on 13.01.2015 in the Chambers of Minister for Finance & Planning, A.P. Secretariat. In this connection, JAC has discussed the matter in detail in the JAC Executive Committee Meeting held on 12.01.2015 at APNGO's Home, Hyderabad and decided to discuss with the Group of Ministers on the following issues. 1) Minimum Pay has to be raised from Rs.13,000/- to Rs.15,000/- and maximum pay from Rs. 1,10,850/- to 1,37,600/-. 2) The JAC expressed dissatisfaction on the recommendation of 29% Fitment by the PRC. The JAC is of the opinion that 69% is appropriate to the present inflation rates. 3) The PRC has to be implemented w.e.f. 01.07.2013 with all monetary benefits. 4) The services of Contract employees and Full Time Contingent Workers has to be regularised. 5) The HRA payable with in peripheral distance of 8 Kms. has to be enhanced to 15 Kms. 6) The maximum Increment rate of 2.33% has to be raised to 2.832%. 7) Gratuity has to be enhanced up to Rs.15.00 Lakhs instead of Rs.12.00 Lakhs. 8) Restoration of Commuted portion of Pension paid after 12 years instead of present 15 years. 9) District Headquarters, viz., Machilipatnam, Sr'ikakulam & Chittoor have to be allowed HRA@ 20% irrespective of Population. 10) The Bad Climate Allowance for the employees working in Agencies has to be restored. 11) The Pay Scales of Common Categories, i.e., Junior Asst., Senior Asst., Superintendent has to be raised on par with Secretariat Staff since the qualifications and work nature are one and the same. 12)180 days Maternity leave to the Contract and Outsourcing employees has to be provided with Pay and Allowances. 13) All employees who are drawing salary from Government has to be provided salaries under 010 Head of Account duly bringing under roof by changing system of Grant-in-Aid etc. 14) The Pay Revision has to be implemented to all State Govt. Employees including Public Sector Undertakings and Gurukula Vidyalayas, Co-operative Societies etc. 15) The superannuation age to State Govt. employees has to be extended to all State Govt. Organisations like Public Sector, Grandhalaya Samsthas, Gurukulas. Societies etc.which were not already enhanced. 16) School Fees reimbursement has to be paid on par with Govt. of India rates. (i) To evolve the principles which may govern the structure of emoluments and the conditions of service of various categories of employees of the State Government, Local Bodies and Aided Institutions, Non‐teaching staff of the Universities including Acharya N.G. Ranga Agricultural University, Jawaharlal Nehru Technological University, Work charged employees and full‐time contingent employees, which have a financial bearing taking into account the total packet of benefits available to them and suggest changes therein which may be desirable and feasible; The Commission however shall, not deal with the teaching staff in Government Colleges and Government Aided Private Colleges drawing UGC/AICTE and ICAR scales. The Commission shall also not deal with the officers of A.P. State Higher Judicial Service and A.P. State Judicial Service who are drawing Pay Scales as recommended by the First National Judicial Pay Commission. G.O.Ms.No.142, G.A. (Spl.A) Department, dated: 07.03.2012. (vii) Review of the existing human resources of all departments in tune with the contemporary requirements including contract/ outsourcing personnel. 01.02. The Pay Revision Commission commenced its work on 13.3.2013 and issued a Press note requesting the Service Associations/ Individuals/ Pensioners’ Associations and employees local bodies, including Zilla Grandhalaya Samsthas, Aided Institutions, Universities including Jawaharlal Nehru Technological and Acharya N.G. Ranga Agriculture University of the State Government employees, to put forth grievances before the Commission by 30th April, 2013. Later, on the request of several associations, the period for submission of grievances was extended to 31st May, 2013 and again to 29‐06‐2013. The Commission also sent a Questionnaire covering various aspects of the ‘Terms of Reference’ to various associations, Unions, Secretaries to Government and all Heads of the Departments. The Commission requested all the respondents to send replies to the questionnaire by 31st May 2013. The Pay Revision Commission followed a flexible approach with regard to receipt of representations and allowed considerable time and freedom to the individuals and associations to present their memorandum and make presentations in person. The Commission also addressed all the Heads of the Departments to furnish information in Proforma I, II, III and IV with a brief right up on the Department. The Heads of the Departments were also requested to appoint a liaison officer to deal with the Commission and to furnish a copy of the latest service rules, special pays and special allowances, by 30th April, 2013. The working of the Commission was greatly strengthened after the Government appointed Sri M.Purushotham Reddy, I.A.S(Rtd) as Secretary to the PRC on19.9.2013. 01.03. The Commission in all received 849written representations and it organized 761 meetings with the Service Associations, Unions and even individuals who had given representations in writing. These meetings were commenced on 5.7.2013 and continued till the middle of December, 2013. The contents of written representations were analyzed and clarifications sought in respect of about 800 categories of services. These meetings were found to be extremely useful and a number of issues got clarified. Many of these meetings were attended by the concerned Special Chief Secretaries/ Secretaries and the Heads of Departments and by the Office Bearers of Employees’ Unions/Associations who all made very valuable contribution to the Proceedings of the Commission. 1965 as a One Man Commission under Justice N.D.Krishna Rao. The 3rd Pay Revision Commission was headed by Sri R.Prasad, I.C.S., (Retd)., the 4th Pay Revision Commission by Sri A. Krishna Swamy, I.A.S., (Retd).., the 5th Pay Revision Commission by Sri K.Subrahmanyam, IAS., the 6th Pay Revision by Sri D.Shankaraguruswamy, IAS.,. (Retd)., the 7th Pay Revision Commission by Sri R.K.R. Gonela, IAS, (Retd. ), the 8th Pay Commission by Sri J.Rambabu, IAS., (Retd) and the 9th Pay Commission by Sri C. S. Rao, IAS (Retd.). 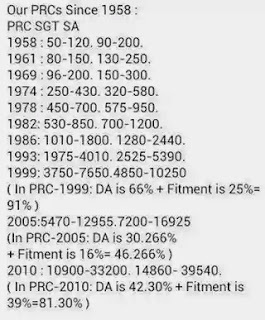 The following table indicates the dates of constitution, time taken by the Commission and other details relating to various Commissions appointed since 1958. 02.02 The constitution of a Pay Commission, at regular intervals, is necessitated to examine the pay structure of employees and to revise it based upon the changing requirements. The expectation of the employee community is that their pay should be increased by the Government from time to time keeping in view the increase in the cost of living, increased expectations with regard to life style and in the case of the retired government servants the increase in life span with consequent problems arising out of age related problems. neutralization for increase in cost of living to all sections of government servants there will be an erosion in the wages of the people who are not fully compensated for such increases resulting in distortion in the pay structure violently disturbing the ratio of maximum to minimum which was established in the first year of implementation of a Pay Commission’s award. They therefore, recommended 100% neutralization for the increase in cost of living for all sections of government servants and pensioners. There, however, remained the issue of erosion in the real value of other allowances which are related to salary and the employees, therefore demanded an increase in other allowances also commensurate with the increase in cost of living. Since the Government of India was appointing a Commission once in 10 years they addressed this issue by providing for increases in other allowances when the DA, as a percentage of the pay, exceeded 50%. In our State, however, since the pay revisions are taking place almost every 5‐6 years the necessity for considering a part of D.A., as pay for purposes of allowances has not arisen so far. demand of employees the Government instead of extending the tenure of the Anomalies Committee, announced the constitution of 10th PRC. It was for the first time that the Tenth PRC was announced by the Government before the due date of revision of pay, i.e. 5 years from the date of earlier PRC. This decision of the Government was widely welcomed by the employees. However, the grievances of employees with respect to the recommendations of 9th PRC remained unaddressed and their subsequent representations have been subsumed into this report. 02.05 This Commission has looked at various aspects affecting the emoluments of the employees and worked out an appropriate package consisting of a streamlined Master Scale, a span of scales that avoids stagnation, ensured that the quantum of increment is consistent with the increases in the quantum of pay and that there is a reasonable increase in other allowances etc. The Commission has also adequately recognized the special needs of women employees and employees who are physically challenged in recommending special leave and enhanced allowances. This time there was no request from the employees’ side either to adopt central pay scales or to look at the private sector for working out the compensation package. All the Associations relied upon the ILC norms to work out the ‘minimum pay’. Variations in the minimum pay demanded by various associations are on account of i) taking the number of members in a family unit as 4 instead of 3; ii) difference in the market price of food and clothing; and iii) addition of new items of expenditure such as mobile phone, transport, fuel, gas, electricity etc., not covered by ILC norms. ‘Minimum Pay’, retained the family size of 3 and adopted the market price of food and other commodities as reported by the Directorate of Economic and Statistics. The Commission also while calculating the ‘Minimum Pay’ adequately provided for the new items of expenditure as demanded by most employees associations and thus made the pay structure more realistic and attractive. 03.01 The terms of reference mandate the Pay Revision Commission to make recommendations on the revision of pay and allowances of employees of State Government, local bodies, aided institutions and non‐teaching staff of universities taking into account the overall financial position of the State Government. There are a number of competing demands on the limited resources of the State Government. The demands on the resources of the State have increased considerably in recent years because of the focus on inclusive growth and the welfare of the weaker sections of the society. The associations of employees have represented to the Commission seeking considerable increase in the existing pay scales and allowances on account of among others a considerable increase in the cost of living over the last few years. Given the committed liabilities and competing demands on the resources of the State Government, these demands cannot be met fully. The Commission is of the considered view that while the pay scales of the employees have to be reasonable to attract talented people into government service and retain them, the responsibility of the State to provide its citizens basic civic amenities and its role in promoting the growth of the economy cannot be viewed in isolation. Therefore, the present financial position of the State Government, its future commitments and growth prospects of the economy are crucial for arriving at a pay structure for employees consistent with the objectives of State policy. 03.02 Andhra Pradesh has been a middle income State. While there has been considerable improvement in the levels of per capita income, the State ranks below a number of states in terms of human development indicators. In this chapter, an attempt has been made to present an outline of the State’s performance in recent years and demands on its resources to arrive at an informed view of the reasonable pay structure for employees consistent with the resource position of the State Government. the State economy which entered a higher growth trajectory in 2003‐04 has been witnessing a slow down in its growth since 2008‐09 following global downturn and deceleration in the growth of the national economy. 12.02 percent in 2007‐08 to 5.29 percent in 2012‐13, it remained marginally higher than the national economy. Reviving the growth momentum is a major challenge for the State Government. Table‐1 presents the trends in the growth rates of GSDP and the GDP. 03.05. The per capita income of the State, which remained below the national average till 1999‐2000, witnessed a turnaround since 2000‐01. The per capita income of the State remained higher than the national average in all the years since 2000‐01 partly due to higher than national average growth of the State economy and largely due to the moderation in the growth of population. The decennial growth of population in the State was 14.6 percent between 1991 and 2001 and 9.11 percent between 2001 and 2011 as compared with the national average of 21.54 per cent and 17.67 percent, respectively. In the year 2012‐13 for which latest data is available, the per capita income of the State at current prices was Rs.78,177 as compared with the national average of Rs.68,757. Trends in per capita income of the State and the country are presented in Table‐2. 03.06. The deceleration in the growth of the State economy being witnessed in recent years is a matter of concern. Given the global uncertainties and domestic supply constraints, it is difficult to estimate the extent of likely slowdown in the State economy and the duration of the slowdown. the fiscal situation. The trends in the fiscal situation of the State are summarized in Table‐3. 14.08 percent of GSDP to 14.84 percent of GSDP while the revenue expenditure witnessed a decline from 15.63 percent of GSDP to 14.80 percent of GSDP. Within the revenue, the major improvement came from the State’s own tax revenue which improved from 7.23 percent of GSDP in 2003‐04 to 7.89 percent of GSDP in 2007‐08. The buoyancy of State VAT coupled with an improvement in the revenue from State excise duties and stamps and registration contributed to this improvement. There was also a marginal improvement in the transfers from the Centre from 4.95 percent of GSDP to 5.01 percent of GSDP in the same period. lower than the budget estimate by about Rs.18,000 crore because of fall in own revenue collections as well as transfers from the Centre. The deterioration in the fiscal position of the State would have been much severe but for the reduction in interest and repayment liability following the debt consolidation and relief facility recommended by the Twelfth Finance Commission for the period2005‐10. over 57 percent of the State’s own revenue is spent on salaries and pensions. The moderation in the expenditure on salaries and pension as a proportion of State’s own revenue and total revenue expenditure is mainly because of higher growth of State revenue and revenue expenditure relative to the growth in the expenditure on salaries and pensions. In fact, expenditure on salaries is one of the fastest growing item of expenditure. Between 2001‐02 and 2013‐14, while the salary expenditure increased by 21.45 percent from Rs.7,791 crores to Rs.36,331 crores, expenditure on pensions increased by 16.33 percent from Rs.2,321 crores to Rs.14,209 crores. trend since 2009‐10. In 2009‐10, the ratio of expenditure on salaries and pensions to own revenue increased from 45.99 in the previous year to 55.25. The expenditure on salaries and pensions as a percentage of revenue expenditure increased from 31.49 in 2008‐09 to 36.71 in 2009‐10. The increase in the ratios is mainly on account of a slowdown in the revenues of the State Government. The increase in the ratio of expenditure on salaries and pensions to own revenue to 57.54 percent in 2013‐14 from 54.93 percent in the previous year is mainly on account of the interim relief of 27 percent paid to the government employees. 03.12. In the context of analysis of the trends in the expenditure of the State government on salaries and pensions, it may be relevant to compare these trends with those of the Central Government. The comparison is not straight forward because of a number of differences. Firstly, the salary expenditure of the Centre as reported in the budget documents is exclusive of the salaries of defense personnel. Secondly, expenditure on pensions reported in the budget documents of the Centre is inclusive of defense pensions but exclusive of Railways and Department of Posts which are treated as operating expenses of these departments. Even with these differences, a broad comparison of the trends in the expenditure on salaries and pensions reveal vast differences between the State and the Centre. The broad trends in the expenditure of the Centre on salaries and pensions are presented in Table‐5. Table­5: Expenditure of the Central Government on Salaries and Pensions. lower ratios of salary and pension expenditure of the Centre are reflective of its higher resource base. Between 1997‐98 and 2007‐08, the ratio of expenditure on salaries and pensions of the Centre to net revenue receipts declined by one‐ third from 25.06 percent to 8.53 percent. The sharp increase witnessed in the years 2008‐09 and 2009‐10 is on account of the implementation of the recommendations of the Sixth Central Pay Commission and payment of arrears. After the absorption of the impact of the Sixth Pay Commission, the expenditure on salaries and pensions of the Central Government constitutes only 12.75 percent of net revenue receipts in 2012‐13, while such percentage for the State is 54.93.
in the redemption ratios in recent years mainly because of policy interventions. These include debt swap scheme under which the States were allowed to swap their high cost debt by low cost additional market borrowings, debt consolidation and relief facility (DCRF) and interest reset on high cost borrowings from the National Small Savings Fund (NSSF) following the recommendations of the Twelfth Finance Commission. Though the current redemption ratio for internal debt is about 0.40, it is unlikely that the lower redemption ratio will continue as nearly 48 percent of the outstanding market loans are due for repayment in the next five to seven years. 03.16. Apart from the debt‐redemption ratios, the Central Finance Commissions have been recommending certain desirable ratios with a view to maintaining debt sustainability. The Eleventh Finance Commission (2000‐05) considered that interest payments as a proportion of revenue receipts of States should not exceed 18 percent for maintaining a sustainable debt level. The Twelfth Finance Commission (2005‐10) felt that a debt‐GSDP ratio of 28 percent would be consistent with sustainable debt levels. The Commission also felt that ideally interest payments as a percentage of revenue receipts should stabilize around 17 percent. The Thirteenth Finance Commission (2010‐15) considered that a debt‐GSDP ratio of 25 percent for all States was feasible. There has been a moderation in the ratios of interest payments to revenue receipts and debt‐GSDP ratio. These are currently within the limits considered sustainable by the Central Finance Commissions (Table‐7). As indicated earlier, the improvement was mainly on account of debt swap scheme, DCRF, reduction of interest rate on outstanding loans from NSSF, the effect of which has started tapering off. The bunching of repayments of market borrowings in the next five years will exert pressure on the debt sustainability ratios. 03.17. As observed by the Reserve Bank of India (RBI) in its Study of State Budgets for the year 2013‐14 the conventional debt sustainability analysis though useful may not provide a comprehensive assessment of debt sustainability as it is based on a narrow coverage of debt and excludes contingent implicit and off‐budget liabilities. Apart from issues of debt coverage this analysis is generally done in a static framework and therefore it does not account for fiscal and economic behaviour in response to shocks (sensitivity analysis) and fiscal vulnerabilities (stress‐testing exercise). 03.18. Apart from the Government guarantees there are likely to be contingent liabilities on account of projects under public‐private partnerships (PPP). Faced with resource constraints and growing infrastructure needs the State Government is constrained to undertake investment projects through PPP route. Two types of liabilities will arise on account of PPP projects. These are both current and deferred liabilities as well as contingent liabilities arising on account of guarantees issued to Special Purpose Vehicles (SPV) or State undertakings to facilitate borrowings by them. The explicit and deferred liabilities in the case of PPP projects arise from annuity payments over a number of years. PPP projects may also result in contingent liabilities arising out of obligations to compensate private sector partners in the event of changes in specifications breach of obligation or termination of contract. The traditional debt sustainability ratios do not capture these liabilities. The number of PPP projects currently under implementation in the State is 169 with an estimated investment of over Rs.58000 crore. Another 37 projects are in the pipeline with an investment of Rs.8000 crore. 03.19. Another major liability for the State Government is on account of its participation in the financial restructuring plan (FRP) of power distribution companies. The fiscal implications of the FRP for participating states are linked to four major aspects: (i) issuance of bonds by the state‐owned power distribution companies (discoms) with respect to 50 per cent of short‐term liabilities (STL) as on March 31 2012 and its subsequent replacement through issuance of special securities by the state governments and (ii) issuance of guarantees towards interest and principal repayment of the balance 50 per cent of STL to be restructured by banks/FIs governments arising from their participation. 03.21. During the year 2013‐14 the Government had introduced a new scheme called “Amma Hastam”. Under the scheme essential commodities are being supplied in a package for Rs. 185 per month. The package includes one Kg. of toor dal one litre of palm oil one kg. of whole wheat atta one kg. of wheat half a kg. of sugar one kg. of salt quarter kg. of chilli powder half a kg. of tamarind and 100 grams of turmeric powder. The expenditure on this scheme is estimated at over Rs.400 crore in 2013‐14. The State Government introduced another unique scheme called “Bangaru Talli” aimed at emancipating the status of the girl child eliminating the practice of female feticide and eradicating trafficking in girl children. To give statutory backing the State Government enacted the Andhra Pradesh Bangaru Talli Girl Child Promotion and Empowerment Act in June 2013. The scheme envisages periodic payments to the girl child right from her birth to the completion of collegiate education. This is likely to impose additional burden on the exchequer. 03.22. The implementation of the Right to Food Act is estimated to impose an additional financial burden of over Rs.1000 crore per annum on the State Government. comprehensive index that measures the overall status of a State in terms of education knowledge and standard of living. Further as recognized by the United Nations Development Programme (UNDP) the HDI which is basically an average across the three dimensions of health education and income conceals disparities in human development across population within a State. Two States with different distributions of achievements can have the same average HDI. 03.24. The inequality adjusted HDI (IHDI) computed by the UNDP takes into account not only the average achievements of a State on these three parameters but also how these achievements are distributed among its citizens by discounting each dimension’s average according to its level of inequality. The IHDI for 19 major States computed by the UNDP are presented in the table below (Table‐9). Andhra Pradesh ranks 12th among 19 states and below the southern States of Kerala, Karnataka and Tamil Nadu.It is a matter of concern that the IHDI in the State is even lower than that States like West Bengal Assam Himachal Pradesh and Uttarakhand. This is indicative of the imperative to improve the HDI in the State by improving education and health facilities. supply constraints and the resultant slowdown in revenue collections and transfers from the Centre. 03.26. There has been a significant fall in the poverty ratios in the State. The overall poverty ratio in the State is 9.20 percent which is much below the nationals average of 21.92 per cent in 2011‐12. It is a matter of concern that the increase in the per capita income and reduction in the poverty levels in the State have not translated into an improvement in the HDI. Ensuring that the fruits of development result in an improvement in HDI is a major challenge for the State. 03.27. The recent deceleration in growth of the economy is of serious concern. Putting the growth momentum back on track will remain the major task of the State Government. So far the State finances have remained sustainable but there are incipient signs of stress. The commitments of the State Government are likely to increase significantly following the introduction of new welfare schemes liabilities on account of PPP projects financial restructuring of DISCOMS and implementation of Right to Food Act. The proposed reorganization of the State is likely to result in additional commitments. 03.28. In the context of the growing commitments of the State the Commission has to tread the fine line between economic rationale and the aspirations of the employees and arrive at a judgment on how much of the State’s resources can be spared for providing for an increase in the salaries and pensions of employees. Despite the constraints the Commission is of the considered view that reasonable increases are necessary to attract talented people to government service to retain them and to nurture in them a sense of commitment to public service. We have tried to strike a balance between the welfare of the people and the need for a fair and reasonable increase in pay and allowances. Our recommendations have been formulated keeping in view the need for meeting the legitimate aspirations of the employees without compromising on the responsibilities of the State towards the welfare of its people. policy was that an employee should be assured of the satisfaction of certain human and social needs, and in regard to the highest salaries, the requirement is that the salaries should while be sufficient to attract persons with the requisite talents and qualifications, and to retain them in service with their efficiency and keenness unimpaired, need not be such as would compare with the highest salaries in outside employments. The Commission was of the view that “sound and equitable internal relativities should be the most important single principle to be followed in the determination of intermediate salaries”. 04.02 The Third Central Pay Commission (1970) held the view that pay determination should take into account the initial qualifications, the training and skill, and the physical and intellectual endowments which the person brought to bear on the post. Further, the difficulty and complexity of the task to be performed as well as the responsibility to be undertaken should be given considerable weight. The third Pay Commission went beyond the idea of minimum subsistence that was adopted by the first Pay Commission. The commission report says that the true test which the government should adopt is to know whether the services are attractive and it retains the people it needs and if these persons are satisfied by that they are getting paid. The Fourth Central Pay Commission (1983) held the view that the pay of a post should be such as to attract persons of the required qualifications and calibre to fill it and the pay also should be sufficient and satisfactory enough to motivate the employee for efficient performance of his duties and responsibilities with a sense of rectitude. employees should not have a feeling that their emoluments were inadequate with respect to their skills, educational qualifications, experience, duties and responsibilities, but also as compared to their peers outside the Government. The Sixth Central Pay Commission (2006) noted that the role of Government itself was undergoing a change from a monopolistic supplier to be that of a facilitator and regulator in the various economic activities, and in that background sought to devise a pay package which would not only provide enough incentive to retain the brightest officers in the Government set up but also attract the best to join it in future. both horizontal and vertical could be used as the basic framework, bringing about only essential changes needed to reflect significant changes in the functional content of the various jobs and correction of glaring distortions which might have crept in and that this exercise inevitably would be judgemental, based on informed discussions with Associations representing various categories of employees and the Heads of Departments and Secretaries to the State Government. or alter some of the parities depending upon the changing needs of the Government and perceptions about the availability of the skilled manpower and the ability of the Government to attract those skilled people into Government service. 04.06. The Pay Revision Commissions also assess the changes taking place in priorities of Government which find expression in the form of new schemes, the mechanism for implementation of these schemes, the availability of qualified manpower to achieve the objectives of the schemes and the incentives to be built in through an appropriate pay structure to enthuse existing incumbents and attract new talent into the service. In this process the pay scales get revised and the parities that once existed in pay may get altered and this sometimes leads to representation from employees of anomaly in pay scales. Other issues generally raised by most associations relate to variation in pay structure at the entry level in uniformed and technical services, in services recruited through a common entrance examination, and in allied services. The representations seeking parity in scales are based on similar academic qualifications, and the size of the territorial jurisdiction etc. These issues have been held not to be valid as academic qualifications alone cannot constitute the basis for determination of pay because conduct of common entrance examination can be a matter of convenience and not be the justification for equal pay and that territorial jurisdiction is determined with reference to the intensity and quality of work and not be a bench mark for pay scales etc. What determines the pay scale ultimately is a combination of many factors. 04.07. This Commission has followed these principles to a great extent in evolving the new pay structure for the employees. In our view, pay structure of posts should be such as to inspire persons of required qualifications and calibre to fill it and be sufficient to motivate the employee for efficient performance of his duties and self‐fulfilment of responsibilities. Minimum pay has to be fixed at a level as would enable the employee to maintain himself and his family in reasonable comfort and to live in dignity as expected of a person of his official / social status. This commission has within the framework of ILC norms incorporated 10 per cent of the expenditure on food, clothing and other miscellaneous items in minimum pay to neutralise the cost to employees of new items of expenditure like transport, education, household accessories, mobile phone and Internet usage etc., in addition to recreation and festivals. 04.08. This Commission has used the existing and traditional relativities both horizontal and vertical in the pay structure of different sets of government employees as the basic framework, bringing about only essential changes needed to reflect the changes, if any, in the entry level qualifications, to rectify anomaly and/ or to maintain two stage step up for promotion posts falling under the ambit of Automatic Advancement Scheme. as Medicine, Engineering, Legal, Agriculture etc. Pay scale at the level of Joint Director / Deputy Director/ Assistant Director is largely kept at the same level across the Departments, to bring in harmony in inter‐departmental functioning. We have also sought to rationalise the pay structure of the non‐ cadre Heads of Departments and of the Additional Directors where the post of the HOD is occupied by Cadre officers, to provide ample opportunity for growth within the Department. Important factors considered while fixing the Scales of Pay for the HOD and the Additional Directors are a) the span of jurisdiction; b) number of Unit Officers; c) Budget handled; d) number of employees in the Department; and e)degree of interaction withstake holders, viz public, non‐officials, government agencies etc. 04.10. The Task Force appointed for evolving pay structure for Engineering Departments did a commendable work in articulating the aspirations of Engineers for a better scale of pay at the entry level and we have substantially accepted its recommendations. However, in doing so we had to give up the traditional one stage difference in the scale of Pay of Assistant Engineer (AE) and Assistant Executive Engineer(AEE) at the entry level. 04.11. This Commission spent considerable time in analysing the pay structure of uniform staff, particularly in Police, Prisons, Fire, Forest, Transport and Excise Departments and improved the scales of pay at various levels. The major challenge was to fix the pay at the initial level of Constable and equivalent. In the Departments, where the entry level qualification of Constable and equivalent is raised to Intermediate, we have harmonised the pay scale by allowing stage improvements. In the Department of Forest and Excise, entry level pay of constables can be brought on par with other uniformed services only when the entry level qualification is likewise enhanced. 04.12. In the Medical, Health and Family Welfare Department, a significant decision taken is to narrow down the difference in the pay scales of Doctors working in AYUSH Department, Visa Vis., the Medical Department on the allopathic side. This has been done keeping in mind the similarity in the course content and duration of studies at the graduate as well as the P.G.levels and to give due importance to the Indian System of Medicine. Panchayat Raj is yet another department that has received our due attention in the revision of pay scale, to give to the post of Panchayat Secretariesadequate importance that it deserves for improving the local self governance. ‘Master Scale’ for the first time. This has the advantage of a single running scale for the entire gamut of the State employment, individual scales assigned to the posts / categories being merely segments thereof and the merit of predictability. For determining the Master Scale, factors taken into consideration are i) Minimum and Maximum pay; ii) Number of pay scales; iii) Span of pay scales at various levels; iv) Rates of increments; and v) Inter – scale relativity. This concept of ‘Master Scale’ is being continued with slight modifications from time to time by the successive Pay Revision Commissions. This time also the employees and their associations have overwhelmingly endorsed for the continuation of ‘Master Scale’, with minor modifications. 05.02. Following the earlier precedent, this Commissionrecommends the continuation of ‘Master Scale’, and suggests in the following paragraphs a new scale of pay for adoption.Inthe new scale we have ensured that there is a reasonable increase in the quantum of increment in absolute terms so that at no point the employee would face a situation of reduced quantum of increment as a result of fixation of pay in the revised pay scales and that the quantum of increment is not only reasonable but also attractive. We have also increased the span of the scales to accommodate people with long service so that they would not stagnate and will continue to get the benefit of increments. In the event of stagnation which should not normally arise, we recommend grant of up to five stagnation increments. 05.03. Majority of Employees’ Associations have suggested for the fixation of ‘Minimum Pay’ ranging from Rs.10000/‐per month to Rs.16150/‐ per month adopting the norms evolved by the 15th International Labor Conference. However, in doing so some Associations have calculated the minimum pay by taking 4 members into account in a family unit and not 3 as earlier, on the ground that the maximum age of recruitment into the government service had been enhanced to 36‐43 years, and many people having wife and two children were now entering the service. 2006‐07 to Rs.68,970/‐ in 2011‐12. The same is at Rs.77,277/‐ per annum at current prices for the year 2012‐13. The nuclear family consisted of husband and wife, two children and a dependant parent. The per capita income for five members come to Rs.3,86,385/‐ per annum or an amount of Rs.32,199/‐ per month. Hence income of a low paid employee cannot be less than the per capital income and suggested for a minimum pay of Rs.16,000/‐ and a maximum of Rs.1,65,850/‐ and a fitment of 75%. 05.05. The Telangana Gazetted Officers Central Association has worked out the ‘Minimum Pay’ by following three different methods, namely, Expenditure method, Calorie intake method and Income method and arrived at Rs.15,000/‐ to be fixed as Minimum Pay. According to the Association the monthly per capita expenditure of the household with four members as family worked out to Rs.14,703/‐ and hence it was essential to have at least Rs.15,000/‐ as Minimum Pay with the fitment of 69.10%. 05.06. The TNGOs Central Union has while reiterating similar facts, have taken 4 members in a family unit for calculating the minimum pay and suggested for a minimum pay of Rs.15,000/‐ and a maximum scale of Rs.1,25,640/‐ with a fitment of 69.10%. 05.07. The Telangana Girijan Upadya Sangam (TGUS) have suggested a Minimum Pay of Rs.15,500/‐ and the Maximum Pay of Rs.1,46,000/‐ with a fitment of 80%.The Telangana Teachers Federation (TTF) have suggested a Minimum Pay of Rs.14,850/‐ and the Maximum Pay of Rs.1,33,020/‐ by proposing at least four members as a family instead of three members. The fitment proposed is 60% with effect from 1.7.2013.The Telangana United Teachers’ Federation have in their Memorandum proposed adoption of Master Scale with a Minimum Pay of Rs.15,250/‐ and Maximum Pay of Rs.1,16,770/‐, with a fitment of 56%. The Progressive Recognized Teachers Union Telangana have similarly proposed Minimum Pay of Rs.15,500/‐ and a Maximum Pay of Rs.1,46,000/‐ with a fitment of 70%. The Telangana Regional Teachers Union have calculated the need based Minimum Pay of Rs.15,950/‐ to be fixed as Minimum Basic Pay and a Maximum Pay of Rs.1,29,350/‐ with a fitment of 75%. The Dalitha Girijana Teachers Union have demanded a Minimum Pay of Rs.14,720/‐ and a Maximum Pay of Rs.1,38,140/‐ with ratio of 1:9.4 between the Minimum and Maximum Pay. 05.08. The A.P. Teachers Federation in their representation has mentioned that the prices of consumer items were on higher side in open market as in March, 2013, when compared to Labour Bureau prices. The cost of cooking gas and house rents, medical reimbursements and electricity may have to be taken into consideration, while determining minimum pay of the employee. For the above items 15% more expenditure is required. Taking into consideration the family unit as comprising of 4 members, the request is tofix Rs.15,000/‐ as a minimum pay and Rs.1,22,300/‐ as the maximum pay, with a fitment of 69%. 05.09. The P.R.T.U, Hyderabad in their representation has stated that minimum requirement of pay for the lowest employee would be around Rs.14,200/‐ per month by taking into account the prevailing cost of essential commodities as on 1/2/2013 which included the cost of Gas Cylinder of Rs.415/. The Union suggested for adoption of a 3 member family as one unit and for a ratio of minimum and maximum pay to be 1:9.7 (14,200 : 1,37,620) with fitment @ 60%. The A.P.U.T.F in their representation have suggested to take 4 member family as one unit and calculated minimum needs of a family to be Rs.19,600/‐ pm, inclusive of Electricity, Fuel, expenditure on Education and Health. However, it requested for Rs.15,000/‐ pm fixed as a minimum pay and Rs.1,41,330/‐ pm to be the maximum pay. The ratio between minimum and maximum pay is proposed to be 1:9.42 and fitment for pay fixation in the revised pay scales 2013 to be @ 60 %.The STU AP in their representation has after inclusion of rates of Fuel charges, Electricity charges, Transport charges and Medical expenditure determined the minimum pay to be fixed as Rs.15,200/‐ pm and suggested a ratio between minimum pay and maximum pay to be 1 : 9.56 and fitment @ 62%. 05.10. The A.P.N.G.Os association in their representation, has stated that recent trends of human necessities and living conditions have not been reflected in the earlier method of calculation of Need Based Minimum Wage and the method adopted by Indian Labour Organization during the year 1960 is being followed even now which is not practical. Keeping in view of the recent trends in living conditions, they have arrived at the Need Based Minimum Wage of Rs.15,000/‐ P.M, duly taking into 3 members of family as one unit. They have proposed to include Latest essential items i.e Education, medical expenses, cell phone, Transport, Drinking water, Gas, electricity and House rent. They have proposed for Master Pay scale concept, with a minimum pay of Rs.15,000/‐p.m. and a maximum pay of Rs.1,37,600/‐ p.m. (ratio being 1 : 9.17) with 32 grades and 80 segments. They have also proposed for a fitment of 69% and increments ranging from 2.198% to 3%. 4 members of family as unit, taking into 2600 calories in taking, shelter, clothing and expenditure on education. The minimum pay is suggested as Rs.20000/‐ and the maximum pay is Rs.161300/‐ per month, duly taking in to account 60% DA as on 1‐7‐2013. The ratiobetween minimum and maximum pay being 8.065% and also suggested for continuation of master scale concept with 32 grades. expenditure on these items had become inevitable and part of the day to day life. 05.13. This Commission has accordingly decided to follow the ILC norms for determining the need based ‘Minimum Pay’. We have not agreed to increase the size of the family unit from 3 to 4 for minimum pay calculation as increase in the age for recruitment into the Government service is only a concession and this will keep changing from time to time and only a very small proportion of new entrants belong to the extended entry age group. In so far as new items of expenditure are concerned, we find that there is a substantive ground to inbuilt into the Minimum Pay structure, the additional expenditure now being incurred by employees on new items such as transport, education, household accessories, mobile phone and internet usage etc. We have accordingly incorporated in the Minimum Pay structure, 10% of the total expenditure on food and clothing and other miscellaneous items towards these new items of expenditure, in addition to recreation and festivals. * = 20% Miscellaneous charges towards fuel, gas, electricity, water etc. ** =Includesexpenditure on new items viz. transport,education, household accessories, mobile phone and Internet usage etc., in addition to recreation and festivals. #Clothing as prescribed is 70 yards per year. This works out to about 5.5 mts per month and the cost includes the ancillary charges like stitching etc. The Commission therefore recommends the minimum pay for the lowest paid employees to be Rs.13,000/­ per month as on 1.7.2013. Rs.1,10,850/­, which represents a Minimum to Maximum ratio of 1:8.527. 05.18. A comparative statement giving the existing Master Scale and the corresponding segments in the revised Master Scale and the span of each of these scales is given in the following table. 05.19. In the proposed scale the highest is to be assigned to Law Secretary besides Secretaries of Legislature, Additional Secretaries to Government and some Heads of Departments. If the Law Secretary is from Judicial Department, as is the current practice, he will continue to remain in the Scale recommended by the National Judicial Commission and adopted by the States. monetary benefit on the employees. of one increment for every 3 years of service, based on the service rendered by the employees. In subsequent revisions of 1986, 1993, 1999, 2005, 2010 the Commission preferred fixation of a uniform percentage as the criteria for fitment in the Revised Pay Scales as it will spread the advantage evenly for all employees. While recommending the new pay scales, the successive PRCs also took into consideration the financial position of the State Government. 06.03. Major Associations have now represented for percentage of fitment on Basic pay ranging from 40% ‐ 60%. Some of the Associations have represented for service weightage as fitment for determining the pay scales. 06.04. The Telangana Gazetted Officers Central Association in their representation has stated that during the period from 1.7.2008 to 31.7.2013, the accumulated inflation had increased to 104.9% where as the Dearness Allowance sanctioned to State Government employee was just 63.344% and as such there was a loss of more 41.596%. There was another loss of 27.504% in the calculation of Dearness Allowance as it was based on the basket of family living survey conducted in the year 1999‐2000 and since them the consumption basket had totally changed and thus the quantum of fitment of 69.10% was essential for the employees to have a comfortable living without financial hardship. 06.05. The A.P. Non‐Gazettted Officers Association in their representation has sought for a fitment of 69% on Basic pay on the basis of difference in the rate of inflation between 2012‐13 and 2013‐14, using the following formula. 06.06. The Progressive Recognized Teachers Union, AP(PRTU) in their memorandum has requested for a fitment of 60% on Basic pay by calculating a rise of 58% in the consumer price index from July, 2008 to February, 2013. 06.07. The Government Junior Lecturers Association in their representation has requested for a fitment of 69% on Basic pay by calculating a) a loss of 25% to the employees due to a difference between the accumulated inflation and the Dearness Allowance sanctioned and b) a change in the consumption basket of employees requiring addition of another 43% in Dearness Allowance to fully nullify the existing inflation. 06.08. It is evident from the representation of employees associations that in deciding the percentage of fitment two important factors have to kept in mind viz a) increase in the prices of consumer items and b) change in the consumption pattern and addition of new items of expenditure. While working out the Minimum Pay, the Commission has taken both these factors into account. The price of food and clothing are taken on the basis of market rates prevailing as on 1.7.2013. Additional expenditure of 10% of total expenditure on food and clothing and other miscellaneous items is now incorporated in the Minimum Pay to also provide for new items of expenditure and changing pattern of consumption. Minimum Pay now fixed is, in our view, a realistic assessment of the money that will be required by an employee of initial cadre to maintain himself and his family in reasonable comfort and with due dignity. 06.10. The Commission recommends that the revised pay scales should come into force from 1.7.2013. As regards giving monetary benefit we deem it appropriate to leave the date from which it would come into effect to the Government keeping in view its resource position and the demands on those resources.